Whitney Vickers | Greene County News Clifton Mill is just days away from opening up for the 2018 holiday season. It will officially open 6 p.m. Friday, Nov. 23. File photo Clifton Mill will remain open seven days per week through Monday, Dec. 31 and costs $10 per person. 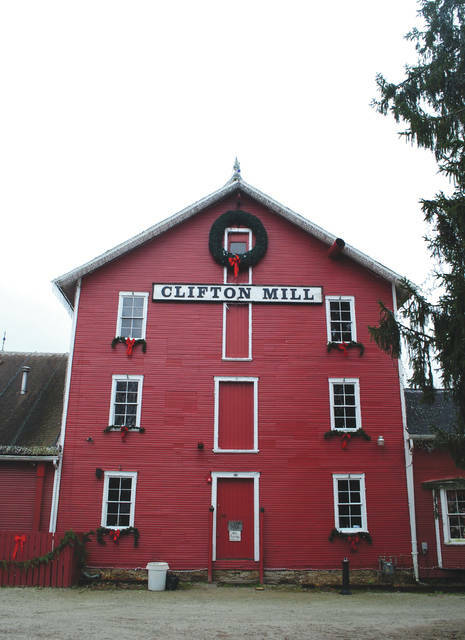 CLIFTON — For more than three decades the Legendary Lights of Clifton Mill have “turned on” for the holiday season. The lights will illuminate the mill, marking the beginning of the season, Friday, Nov. 23. Ohio Attorney General and Ohio Governor Elect Mike DeWine will flip the switch for Clifton Mill’s 31 year. Gates open at 5 p.m. and precisely at 6 p.m. more than 4 million lights brighten the night instantly, transforming the mill and gorge into a shimmering world of Christmas wonder. Clifton Mill is open seven nights per week through Monday, Dec. 31. What began as a simple idea of stringing a few strands of lights on the historic mill for the enjoyment of family and friends is now one of the largest outdoor holiday displays in the country. Now, millions of lights later, the Legendary Lights of Clifton Mill decorate the mill, trees, river banks and almost everything in between, including the water wheel. One of the big crowd pleasers is the covered bridge synchronized light and music show, which occurs hourly each night. The owners began work on a miniature village 31 years ago with scaled down versions of some of Clifton’s historic buildings built by an artisan in Pennsylvania. There have been new additions each year by a variety of artists and today it is a sight to behold with street after miniature street of scaled down homes and businesses, a tiny Fire Department putting out a “house fire,” an outdoor train, a 1950s drive-in theatre, a county fair and more that will be lit up for the holidays. Clifton Mill has more than 3,000 examples of Santa Claus on display dating back to 1850. Some are toys, some used for advertising. A real, live, Santa will be popping out of the chimney. 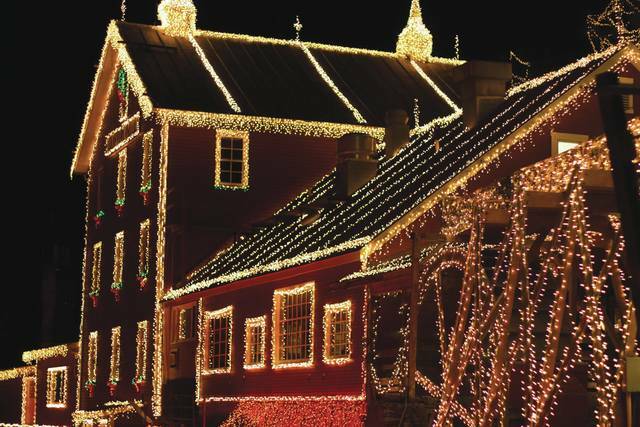 The Legendary Lights of Clifton Mill is an outdoor event and weather permitting. Call beforehand. Admission is $10 per person for everyone age 7 and older. Concession Food is available. According to a press release by Clifton Mill, the best time to visit is Monday through Thursday. Clifton is in Greene County, Ohio three miles east of Yellow Springs on State Route 343, six miles south of Springfield on State Rt. 72, and three miles north of Cedarville on State Route 72. For more information visit www.cliftonmill.com, follow the page on Facebook or call 937-767-5501.
https://www.fairborndailyherald.com/wp-content/uploads/sites/50/2018/11/web1_cliftonmill20181.jpgWhitney Vickers | Greene County News Clifton Mill is just days away from opening up for the 2018 holiday season. It will officially open 6 p.m. Friday, Nov. 23.
https://www.fairborndailyherald.com/wp-content/uploads/sites/50/2018/11/web1_The-Mill.jpgFile photo Clifton Mill will remain open seven days per week through Monday, Dec. 31 and costs $10 per person.